The Main Street Electrical Parade has long been a Disneyland favorite. To help kick off the park's 60th anniversary Diamond Celebration, Paint the Night, a new-age version of the classic parade, is lighting up Main Street U.S.A. with dazzling displays of light-bathed floats and performers. Using sophisticated smart tech that allows a wide palette of hues and remarkable precision, the grand-scale spectacle displays stunning choreography. It's one jaw-dropping moment after another. 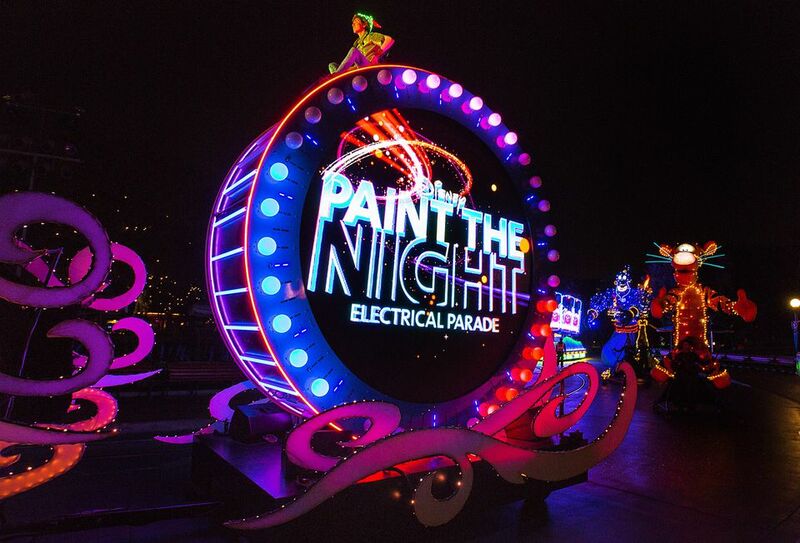 The upgrade from the original Electrical Parade's incandescent lights to Paint the Night's LED lights -- some 1.5 million of them -- along with advances in programming the lights, makes the quantum leap forward in the presentation possible. The technology, which Disney first introduced at a Hong Kong Disneyland version of the parade, is largely invisible to spectators (as it should be), but the experience of seeing vast arrays of lights shift color and intensity perfectly on cue is startling and makes it clear that something amazing is going on behind the scenes. Paint the Night is a collection of colorful floats representing classic and more recent Disney and Pixar films and characters. Unlike the other nighttime spectaculars that debuted at the same time, the Disneyland Forever fireworks show and World of Color – Celebrate, the parade doesn't attempt to tell a linear story. Its series of scenes are stitched together with a bouncy, almost disco-ey, score that includes a dash of "Baroque Hoedown" (the theme song of the first Electrical Parade), "When Will I See You Again" (from Wreck-It Ralph), and tunes borrowed and reinterpreted from the represented movies. The procession kicks off with a gang of "fiber fairies" dancing and making way for a flying Tinker Bell. Perpetual boy Peter Pan follows atop a giant bass drum, another nod to Disneyland's original Electrical Parade. But this drum showcases next-gen technology as it morphs into different colors and patterns. Similarly, a Monsters, Inc. float is filled with doors that constantly change and open to reveal wacky characters from the movie. One of the most captivating segments of the parade is devoted to the Pixar movie, Cars. The trailer of a life-size Mack the Truck is open to reveal a matrix of lights arranged in a three-dimensional grid. Called a "volumetric display" by the Imagineers that designed it, the grid is capable of showing depth as well as movement. It's hard to believe that by turning lights on and off and changing their colors, Disney's tinkerers would be able to create such striking imagery. Both the mighty King Triton from The Little Mermaid and floppy-eared Slinky Dog from Toy Story sport animated faces that really bring the large characters to life. The kaleidoscopic pinwheels of light that make up Slinky Dog's body are another over-the-top visual treat. The ice palace on the Frozen float (of course, the parade had to include the Nordic princesses, right?) is especially bright. Paint the Night ends, as do most Disney parades, with the fab four gang. Mickey's float, adorned with a mesmerizing, psychedelic Mobius strip, is especially trippy. Like some Luddite traditionalist, a part of me mourned the original Electrical Parade, with its cheesy, synth-heavy music and its old-school floats. The new parade, while dazzling, seems almost too precise and polished at times. Maybe it's a case of too much high tech and not enough high touch. Paint the Night certainly impresses with its luminosity and pageantry, but it dosen't quite strike the same emotional chords as its predecessor. I would have preferred a few more hints of nostalgia and whimsy. The Main Street Electrical Parade will forever be enshrined in park fans' memories. Still, Paint the Night is a flashy successor and, over time, will likely become a beloved fixture in its own right. Discover what Disney did to celebrate Disneyland’s 50th anniversary. Tinker Bell and her band of "fiber fairies" kick off Paint the Night, the updated electrical parade at Disneyland. Tethered to her float with a pivoting arm, Tink is able to "fly" as she dispenses her pixie dust. Following a trend in Disney attractions such as the Seven Dwarfs Mine Train Ride, Slinky Dog features a projected, animated face. It helps to give his character some personality and charm. The huge Mack the Truck float features a matrix of lights known as a "volumetric display." It is capable of showing depth as well as movement. The many doors on the Monsters, Inc. float keep opening to reveal the oddball array of characters that populate its world . As with Slinky Dog, King Triton has an animated face projected onto his figure. Mickey Mouse closes out the parade aboard a float with an especially trippy light display. As is common in the travel industry, the writer was provided with complimentary services for review purposes. While it has not influenced this review, About.com believes in full disclosure of all potential conflicts of interest. For more information, see our Ethics Policy. How Cool Is Disney’s Toy Story Mania Ride? What's New at Disneyland for 2019?